In 400 pages, CUNY sociologist William Helmreich describes the neighborhoods of Brooklyn and makes recommendations about what to see when walking. The book is split into 43 different sections, one per geographical region, so each gets about 5-10 pages, including a map and some black and white photos. So The Brooklyn Nobody Knows is an easy book to dip into. Helmreich writes in the first person, describing his walks moving from street to street, reporting on the people he sees, who he encounters, and what it is like to be there. He gives recommendations about how to safe in the rare cases of dangerous neighborhoods, and these days nearly all of Brooklyn is pretty safe in the daytime. So much of Brooklyn has been gentrified in the last three decades, and that's one of the major themes of Helmreich's reflections on walking around. The attractions of prosperous areas like Brooklyn Heights or Park Slope are obvious: walking around them is always an experience of seeing what has changed most recently, and how the demographics are changing. As Helmreich points out, the far more economically challenged areas like Brownsville and East New York have changed much less, but his tour around them finds points of historical interest and even some beauty. He talks to people everywhere and reports his conversations. So he gives an insight in what the areas are like that you wouldn't get just from looking around or using Google Street View. He expresses his enthusiasm for the area and shows what makes it so interesting to explore. 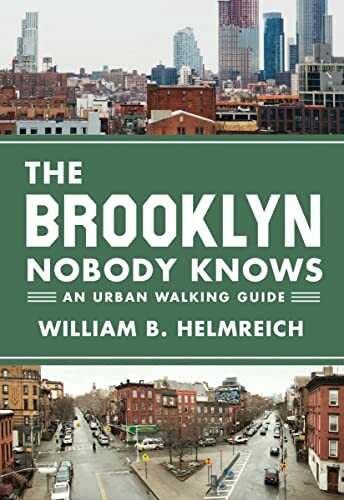 Helmreich's book, which follows on from his 2013 The New York Nobody Knows: Walking 6,000 Miles in the City, really emphasizes the cultural and ethnic diversity of Brooklyn, and shows awareness of many of the political and social issues facing the city. But it isn't very helpful as a guidebook. It isn't particularly easy to walk around with it, especially if you are also using your Google Maps app on your phone in the other hand. It's better to keep the book at home to inspire your exploration of the city, or else in your backpack to read in a café or diner when you get the chance. It would also be more attractive if it had more photos.